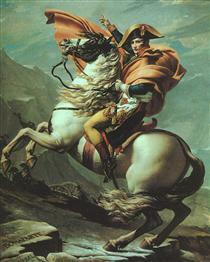 Jacques-Louis David (/ʒɑːkˈlwi ˈdɑːviːd/; French: [ʒa.klwi da.vid]; 30 August 1748 – 29 December 1825) was a French painter in the Neoclassical style, considered to be the preeminent painter of the era. In the 1780s his cerebral brand of history painting marked a change in taste away from Rococo frivolity toward classical austerity and severity and heightened feeling, harmonizing with the moral climate of the final years of the Ancien Régime. 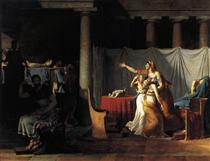 Jacques-Louis David was born into a prosperous family in Paris on 30 August 1748. When he was about nine his father was killed in a duel and his mother left him with his well-off architect uncles. They saw to it that he received an excellent education at the Collège des Quatre-Nations, University of Paris, but he was never a good student: he had a facial tumor that impeded his speech, and he was always preoccupied with drawing. He covered his notebooks with drawings, and he once said, "I was always hiding behind the instructor's chair, drawing for the duration of the class". Soon, he desired to be a painter, but his uncles and mother wanted him to be an architect. He overcame the opposition, and went to learn from François Boucher (1703–1770), the leading painter of the time, who was also a distant relative. Boucher was a Rococo painter, but tastes were changing, and the fashion for Rococo was giving way to a more classical style. 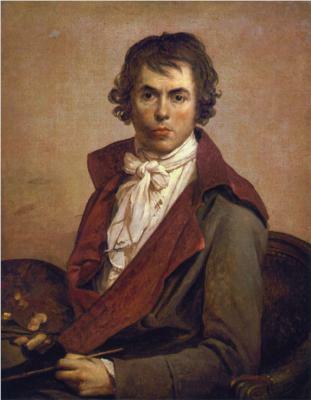 Boucher decided that instead of taking over David's tutelage, he would send David to his friend, Joseph-Marie Vien (1716–1809), a painter who embraced the classical reaction to Rococo. There David attended the Royal Academy, based in what is now the Louvre. Each year the Academy awarded an outstanding student the prestigious Prix de Rome, which funded a three- to five-year stay in the Eternal City. The culmination of the Academy's educational program, the Rome trip provided its winners the opportunity to study the remains of classical antiquity and the works of the Italian Renaissance masters at first hand. Each pensionnaire was lodged in the French Academy's Roman outpost, which from the years 1737 to 1793 was the Palazzo Mancini in the Via del Corso. David competed for, and failed to win, the prize for three consecutive years (with Minerva Fighting Mars, Diana and Apollo Killing Niobe's Children and The Death of Seneca), each failure contributing to his lifelong grudge against the institution. 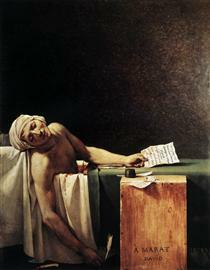 After his second loss in 1772, David went on a hunger strike, which lasted two and a half days before the faculty encouraged him to continue painting. Confident he now had the support and backing needed to win the prize, he resumed his studies with great zeal—only to fail to win the Prix de Rome again the following year. 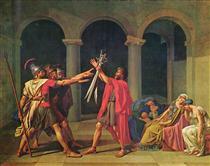 Finally, in 1774, David was awarded the Prix de Rome on the strength of his painting of Erasistratus Discovering the Cause of Antiochus' Disease, a subject set by the judges. 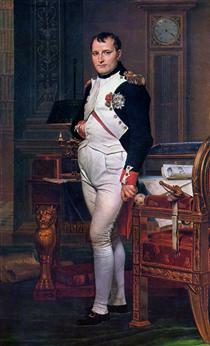 In October 1775 he made the journey to Italy with his mentor, Joseph-Marie Vien, who had just been appointed director of the French Academy at Rome.